Do not think the power you have is only the power you ordinarily use, and moan you have little strength. The power you ordinarily use is like the small visible segment of and iceberg. By unifying mind and body we can use the great power that is naturally ours. Our lives are comprised of the tangible and intangible. Body is tangible, mind is intangible. We receive both from the universe at birth. To develop our full potential, we study these aspects of our nature as one unified whole. 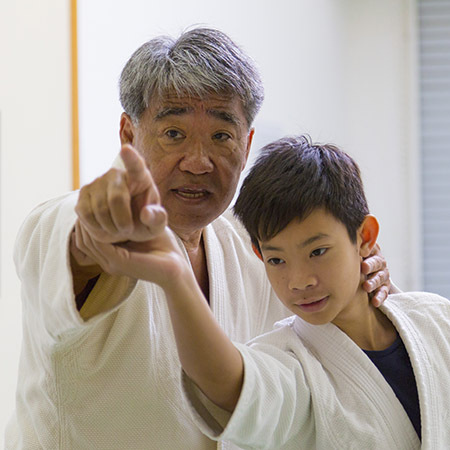 Koichi Tohei, founder of the Ki Society, developed our training method, called Unification of Mind and Body, through a lifetime of study and experience. That which you hold in your mind finds expression in the body. We cannot see the mind directly, but can know the state of the mind by testing the body. In this way we can learn and practice harmony of the two and experience the great power that is naturally ours, increasing the natural flow of Ki through our bodies and in our lives. 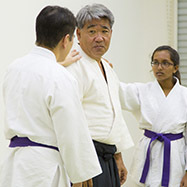 The Ki Society provides a variety of programs useful to all ages and abilities. 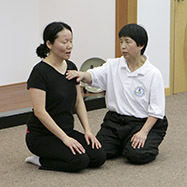 Experience these simple and powerful methods at a free introductory lesson. Ki is living energy. Ki, like mind, is intangible. It can be described this way: The universe is a collection of infinitely small particles we call Ki. When our mind and body are unified, Ki of the universe flows through us freely. Infinitely small and always in motion, Ki is the root of all things. Everyone can do this. Our membership is diverse, and fully engaged with our community. In our lives outside of the Ki Society, we are neighbors, professionals, students, homemakers, craftsmen, artists, athletes, and more. We share a common goal of personal development, to make a positive contribution to our families and communities.